Hot new concept gives us best look at new STI. Last year, Subaru unveiled the Viziv Performance concept at the Tokyo Motor Show, and now we’re about to see its hotter sibling at this week’s Tokyo Auto Show. Set to be revealed in just a few days on January 12, the Subaru Viziv Performance STI Concept will most likely preview the next-generation WRX STI which is long overdue an overhaul. Subaru’s Design Chief Mamoru Ishii has already hinted that the next-gen WRX will be heavily inspired by the concept, so chances are the soon-to-be-revealed STI concept will spawn a production version. From the teaser images, the STI Concept has been fitted with a raft of sporty upgrades including an obscenely large rear wing which of course is a signature design feature of the fabled sports sedan. It also sports red accents and copious amounts of STI logos plastered all over the body to remind you that this is the hot version of the WRX. Winglets can also be seen protruding from the sides of the rear wing, presumably to improve the airflow. 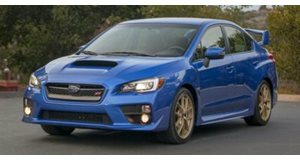 No powertrain details have been disclosed yet, and while the new WRX STI is likely to still be all-wheel drive to meet expectations, Subaru has already stated that the WRX’s turbocharged 2.5-liter boxer engine won’t be reprised. Instead, Subaru is exploring the possibility of electrification to extract more performance, with rumors suggesting the next WRX will be powered by a smaller 2.0-liter boxer unit driving the front wheels with an electric motor powering the rear axle. Expect to learn more when the Subaru Viziv Performance STI Concept debuts this week.